Hi! As you may have noticed, we’re rotating Recommended Reading between a few contributors now. This is my first one, and it may have a little bit of a different style? I don’t know. Anyway, here it is! A woman faces the ocean, her back to the camera. An aqua bikini top is tied across her bare back and her arm holds her hair at her neck. A prominent scar runs down her spine. My daughter will inherit my scar. 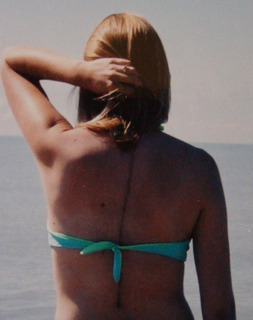 Obviously I know that you can’t inherit a scar, but she’ll likely end up having the same spinal surgery as me in the future. We both have scoliosis. Pretty bad scoliosis. I was diagnosed at eight; she was diagnosed at five. I wore a back brace and she wore one too. … There is no reason to cover it up. Disability is one of those things that makes people feel awkward – there is perhaps a deep-rooted, psychological fear of contamination by association. So what we often do when something makes us feel uneasy is to laugh about it. It’s still well within living memory that TV comedians would poke fun at people from different ethnic groups – but broadcasting executives soon cottoned on to the fact that they risked alienating growing sections of their audience for the sake of a cheap gag. A Colorado Springs lawyer who refused to allow a veterinarian and her service dog to enter his law office for a scheduled deposition in a civil action has agreed to pay $50,000 to settle a federal discrimination suit. LeHouillier demanded the veterinarian, Joan Murnane, prove her dog, an Australian shepherd, was a certified service dog. According to the suit, LeHouillier was not satisfied after reviewing a letter documenting Murnane’s need for the dog. LeHouillier feared the dog would soil recently installed carpeting, according to the Justice Department complaint. The FBI is investigating an affordable-housing deal in which Los Angeles officials channeled $26 million to a developer who they knew was under criminal investigation for alleged misuse of public funds, city officials said Thursday. The developer, David Rubin, was indicted last fall in New York for alleged bid-rigging and fraud, charges unconnected to the L.A. project. The $26 million went toward construction of a 92-unit apartment building near downtown L.A. for disabled homeless seniors. It has sat empty since October while its prospective tenants live in shelters or substandard housing. .-= SavvyChristine´s last blog ..Advice That Works =-. *blush* thanks for the feedback! and i’ll make sure the other FWDers see it – especially Lauredhel, who did it for so long!! Thank you kindly for recommending my blog entry as recommended reading. I love reading your website. I very grateful that there is a community online that fits with my views about disability and feminism.